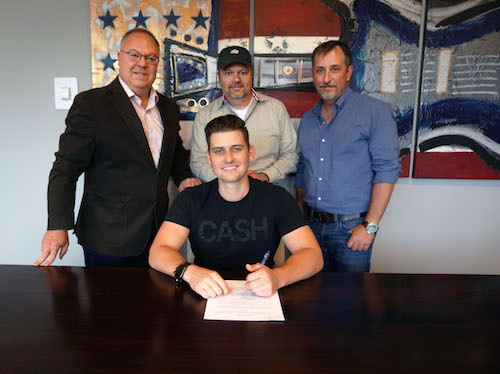 Emerging country artist and songwriter Austin Burke has signed with 287 Entertainment for exclusive management representation. Burke, a Phoenix native, released his self-titled EP in 2017. The project has amassed more than 50 million lifetime streams and currently boasts 3.6 million monthly streams. Two songs from the EP, “Whole Lot in Love” and “Sleepin’ Around,” have been featured on a number of prominent playlists, including Spotify’s Hot Country, Apple’s Breaking Country and Amazon’s Introducing: Country. “Whole Lot in Love” is Burke’s highest streaming song to date, with more than 40 million combined streams. Burke’s music has also received airplay on Sirius XM’s The Highway. Earlier this month, Burke signed a worldwide recording deal with AWAL, Kobalt’s recording company. AWAL’s partnership with Burke began with global distribution services and progressed in the wake of the success of his EP. AWAL’s newly acquired partner, in2une Music, is arranging a multi-city radio tour in support of “Whole Lot in Love.” The tour kicks off this week, ahead of Burke’s performance at the Faster Horses Country Music Festival in Michigan. Burke is currently touring the United States and will be releasing new music in the near future. An acoustic version of “Whole Lot in Love” will be available worldwide on July 20, and a new single, “One Summer,” is slated for release on August 3. Visit AustinBurkeMusic.com, or find him on socials, for up-to-date tour dates and information.